Debate: Missile, space and nuclear programmes – Indigenous OR purchase-assemble job? Let this thread be and delete the other one with similar content because this title clarifies the matter. This question will be answered later. First let's see how they did it and how they are still doing it. This is full of metaphors/allegories. The explanation will be done by metaphors/allegories throughout. In the below video, the two chaps are oscillating their heads from side to side. A debate has been set off in circles like US state department and Western governments on whether Indian space and missile programmes are indigenous or whether they are purchase and assemble job. Goras are having sleepless nights wondering whether India's rocket science is indigenous or not. Debate has been inconclusive symbolized by the prolonged oscillations. Sometimes it feels like it's indigenous. Sometimes it feels like Indians have simply purchased the technology from various foreign sources. In between even as the firangis are debating, India's border problems (for instance Kashmir is resolved in India's favor) and the oscillations continue even afterwards. This debate was triggered in past decades as well. Remember the coffee-toffee ad campaign of 1990s? Coffee means the technology was home-grown. Toffee is the metaphor for funds to purchase foreign technology. Remember the punch line was: The argument continues. Indeed the argument has continued till 2018 and is likely to continue further. Remember the 'Pluto is planet or not' debate of noughties decade? That too is a metaphor. Metaphor for whether India has the capability to develop nuclear weapons, missiles and space rockets on it's own. 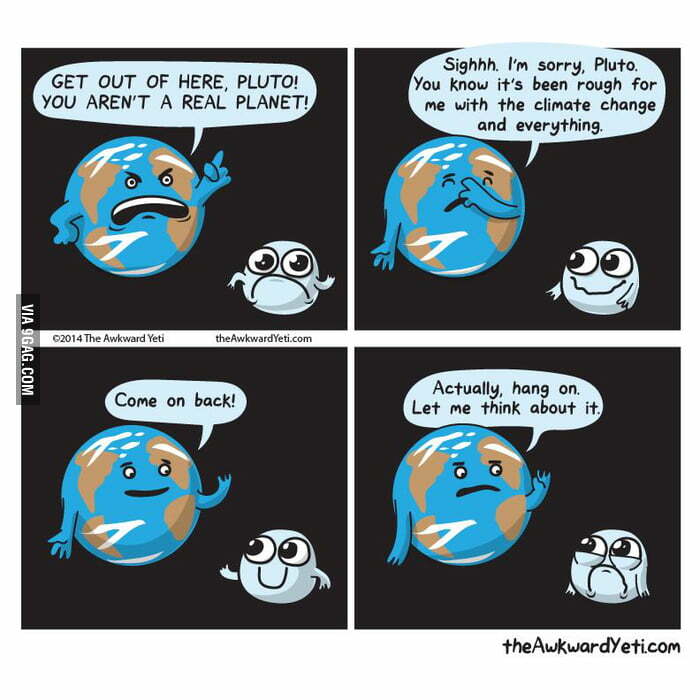 If yes, Pluto is a planet otherwise no. Last edited by Ramesh Suresh; August 15th, 2018 at 01:19 AM. Re: Debate: Missile, space and nuclear programmes – Indigenous OR purchase-assemble job? India has been developing space technology on its own with and without help from other nations. I remember, from a long time ago, that there was a critical component which works like a gyroscope and is what is needed for flight path guidance, etc. This technology was not being shared/sold to India by nations like USA, France, etc who had it. In the same report, I remember reading that India developed it on its own. So, we have some brilliant minds in ISRO who have done some great indigenous work. And we have also bought some technology from our allies. Recently we launched multiple satellites at once using just one rocket and the world did take notice. You have posted 2 youtube videos and then a cartoon strip. So what exactly is the question/topic/issue you are trying to get at? What was the date of that report? If you don't remember the exact date, can you tell like first half of 1990s, or second half of 1980s? Please Google... I guess you know you can... It was in a newspaper... online.. so must be after 1990. To answer your question, it is very straightforward. Mossad contacted Raw about Bangla immigration. ISI immediately contacted south Indians to act rude. That was a clue for ISRO to launch those satellites. I think Pluto is a planet. The nuclear test was just a fizzle not a bang. Top Scientist Reveals Yield Much Lower Than Expected. New Delhi: The 1998 Pokhran II nuclear tests might have been far from the success they have been claimed to be. The yield of the thermonuclear explosions was actually much below expectations and the tests were, perhaps, more a fizzle rather than a big bang. The controversy over the yield of the tests, previously questioned by foreign agencies, has been given a fresh lease of life with K Santhanam, senior scientist and DRDO representative at Pokhran II, admitting for the first time that the only thermonuclear device tested was a “fizzle”. In nuclear parlance, a test is described as a fizzle when it fails to meet the desired yield. New Delhi: Should India conduct more tests to improve its nuclear weapon programme? Yes, says K Santhanam, senior scientist and DRDO representative at Pokhran II. The 1998 nuclear test was said to have yielded 45 kilotons (KT), but was challenged by western experts who said it was not more than 20 KT. The exact yield of the thermonuclear explosion is important as during the heated debate on the India-US nuclear deal, it was strenuously argued by the government’s top scientists that no more tests were required for the weapons programme. It was said the disincentives the nuclear deal imposed on testing would not really matter as further tests were not required. According to security expert Bharat Karnad, Santhanam’s admission is remarkable because this is the first time a nuclear scientist and one closely associated with the 1998 tests has disputed the government line. “He is not just saying India should not sign the CTBT, which I believe is completely against India’s interests, but also that the 1998 thermonuclear device test was inadequate. His saying this means the government has to do something. Either you don’t have a thermonuclear deterrent or prove that you have it if you claim to have it,’’ said Karnad. Sources said Santhanam had admitted that the test was a fizzle during a discussion on CTBT organised by IDSA. Karnad said no country has succeeded in achieving targets. “Two things are clear: India should not sign CTBT, it needs more thermonuclear device tests,’’ said Santhanam. The yield of the thermonuclear device test in 1998 has led to much debate and while western experts have stated that it was not as claimed, BARC has maintained that it stands by its assessment. IN 1998 India conducted nuclear tests at a remote Rajasthan desert site for a second time and claimed success. First tests had been conducted in 1974 11 YEARS LATER The yield of explosions much below expectations. Tests were more a fizzle. This adds more muscle to India’s argument against signing on the dotted CTBT line. The façade of exotic culture of Ramanujam, C V Raman, Vishwanathan Anand, Abdul Kalam etc and the ancient heritage of civilizational past of the likes of Aryabhatta etc. Wow!!! Awesome country! Great country! That the missile, space and nuclear programmes are not indigenous but purchase-assemble job. Yes, these difficulties are indeed there but that doesn't prove that India's programmes are indigenous. It may be that India wouldn't have produced these technologies even if these difficulties were not there. Desis and some gullible Goras buying Indian propaganda that their rocket and nuclear technology is indigenous. Last edited by Ramesh Suresh; August 17th, 2018 at 08:52 AM. I have been observing this joker. Please don't delete.. he is providing good quality entertainment. It was getting very serious on this site, which is very boring. His bizarre theories are a good break from mundane / rational thinking. Have you ever wondered if the Japanese were plotting the surrender of Northies to the Southies?? Have you? Have you ever thought about the impact of Indian movies on the betterment of battered societies?? No, you don't. Ramesh chutiya does! Truth is bitter. That's why you are attacking me personally instead of facing the facts. I am with you on this, Ramsureshchan pai, your theories are perfectly logical and rational... and absolutely factual. But echans still attack on person, a person who has nothing to do with his theories. Theories theories hai, and Ramekuresh pai, Ramkaranmurad pai hai. It is different. I hate it when RAW does that! On one end they are imposing GDPR rules in Europe and the other end they are filming a movie in Malaysia.